Patagonia Frontiers is a diverse community with a shared passion for nature, education, and conservation. Trained as a climber and wildlife biologist at Ohio State University, John has had a particular affinity for wild places ever since he was a child. He is an educator, mountaineer, explorer, entrepreneur and a true believer in the power of trust, respect and tolerance. He has climbed extensively in South America, Europe, Africa, Asia, and North America. His climbs have included Kilimanjaro, Denali, Aconcagua, Mexico, Yosemite, New Zealand and many others. John had a 24-year long career with the National Outdoor Leadership School (NOLS) where he founded and directed the Patagonia branch for fifteen years leading numerous expeditions and field time. He founded Patagonia Frontiers in 1999. In addition, John was a member of Chile's National Committee on Safety and Risk Prevention in Mountain Sports and a private outdoor risk management consultant. When John isn't at home in Patagonia, he guides in many other places including Kilimanjaro and Denali. Don Alfonso was born in the valley and knows every nook and cranny of the area. He is our neighbor and frequently joins us on expeditions as a horse guide and packer. Don Lucho (Luis) was also born in the valley and like Don Moncho, knows the area backwards and forward. He is our neighbor and frequently joins us on expeditions as a horse guide and packer. Kelly is a wilderness guide for our guided and supported treks, mountaineering, and high school groups. Kelly grew up in Colorado and attended the University of Colorado at Boulder. She graduated with degrees in Psychology, Geography, and Philosophy, and spent most of her free time learning how to climb. She spent a few years working at a local climbing gym and traveling throughout the United States in search of great climbing. Since then, she has worked as an interpretative ranger for the U.S. Forest Service, and as a member of the AmeriCorps Emergency Response Team. She is trained in wildland firefighting, trail construction, and as a sawyer for the U.S. Forest Service. She is passionate about learning, both about herself and about other cultures, communities, and environments, and is thrilled to continue living and exploring places abroad. Michael is from Tanzania. He guided Kilimanjaro with John for several years and moved to Chile to work at Patagonia Frontiers in 2009. Besides guiding Patagonia Frontiers expeditions, he has been instrumental in building out our greenhouses and ensuring we are stocked with fresh seasonal food. When he isn't at the ranch, Michael is studying to become a dentist and playing with his 1-year old daughter. Clair grew up in Baltimore, Maryland and went to Williams College in Massachusetts. She studied abroad in Germany and China. After college she did two years of Americorps, worked on an organic farm in Maryland, spent a year doing a working holiday in New Zealand, and spent a winter doing dog sledding trips in Maine. Clair learned about Patagonia Frontiers after taking a NOLS course, and she is excited to return to Patagonia for a second year. Clair loves travelling, sailing, hiking, reading, animals of all kinds, and the great outdoors. Jorge was born and grew up in Patagonia. He grew up in the mountains, forests, rivers, and lakes that make up this breathtaking region. He loves the natural world, enjoying the simple life, and being outdoors. Jorge joined Patagonia Frontiers in 2001 and guides expeditions, is our expedition cook and ranch project coordinator. Born and raised in Maryland, Tammy was a career law enforcement ranger with the Maryland Park Service. Prior to her retirement in 2012, she joined the Patagonia Frontiers team, spending time working at the ranch and also working remotely from her home. Tammy has successfully expanded the Patagonia Frontiers work crew program over the last several years, manages our social media and is an amazing photographer. Tammy enjoys cooking, photography, hiking, scuba diving and traveling to remote places around the globe. Chris is a wilderness guide for our guided and supported treks. Chris is also a work crew leader for the many and varied ranch projects including train maintenance, bridge building, forestry, and construction. Chris graduated from Emory University in Maryland with a dual Bachelors of Arts in Economics and Political Science. Since, he has enjoyed spending his time working in more outdoor educational roles. Chris was a backcountry instructor for Camp Thunderbird Inc., and the Mountain Institute. He has instructed for backcountry trips in locations such as Olympic National Park, North Cascades National Park, Mt. Rainer National Park, Mt. Baker/Snoqualmie, and the Dolly Sods Wilderness. Chris has deeply enjoyed alternating summer seasons traveling between the two hemispheres. In addition to his love of the outdoors, he enjoys traveling, playing his mandolin, reading and writing. Chris has spent several years living in Spanish speaking countries including Spain, Chile and Argentina. Living and learning in other places around the globe continues to impact Chris' life powerfully. He feels those moments of vulnerability are captivating and he hopes to continue exploring for years to come. Tania was a client of Patagonia Frontiers in 2013. She fell in love with the ranch and business and returned to join us as a staff member helping to manage our customer relations and business operations. Before joining our team, Tania worked at Microsoft where she led multi-function global customer service and support teams for Microsoft’s Advertising business. Tania has over 15-years experience building and running global organizations and operations for enterprise customers in different sized companies (startups, SMB and corporate) across the Digital Marketing ecosystem. Tania graduated from the University of Washington Business School in 1999 with a major in Marketing and Information Systems. She is currently completing her graduate degree in Transpersonal Ecopsychology from Naropa University. Tania Escudero is from Mexico, currently lives in Seattle with her husband and two children. Mike guides a variety of different outings including educational programs, supported treks, and mountaineering trips. Mike is also a work crew leader for the many and varied ranch projects including train maintenance, bridge building, forestry, and construction. When he isn't at the ranch, Mike attends paramedic and firefighter school and works in outdoor and environmental education in the U.S.A.
Nancy is a wilderness guide for our horse riding trips. As a lifelong adventurer, wilderness guide, and outdoor educator, Nancy has traveled from Antarctica to the Arctic Ocean. Nancy's life as a climbing guide has given her the opportunity to experience the world’s highest summits. In 1999, she took off across Patagonia alone on horseback. Over the next two decades and three thousand kilometers of rugged horse trail, the hospitable people of Patagonia embraced her. They taught her what she needed to know, and Patagonia slipped silently into her soul. 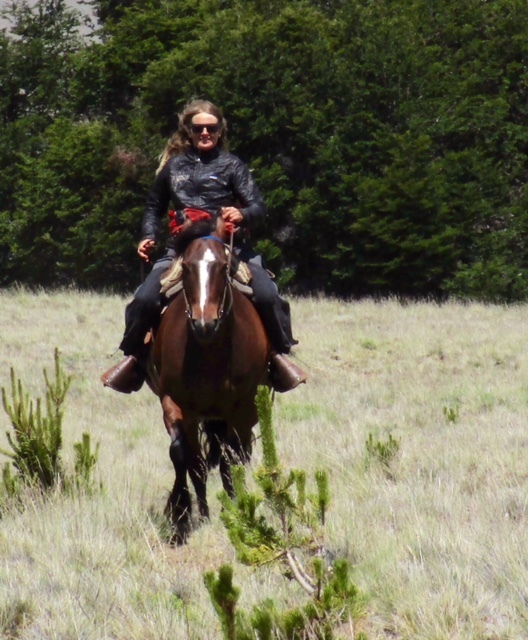 She recently published a book, Riding Into the Heart of Patagonia that was released May of 2018. When she is not in Patagonia, she lives in a cabin outside Palmer, Alaska, where she enjoys the luxuries of hauling water, chopping wood, and high-speed Internet.